Almost everyone, from every generation since the 50’s, has heard of Uncle Milton’s ant farm. While Milton Livine made his fame and fortune by shipping live ants directly to customers of his ant farm, he only shipped a small number of females to inhabit your first ant farm. Unfortunately In a matter of weeks or month, the ant would eventually die off and the ant farm fascination would lose its appeal. 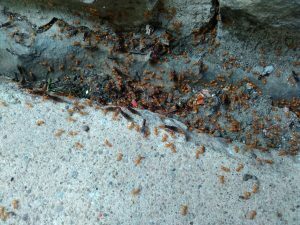 One of the most important aspects of keeping an Ant colony is the interaction as a colony as a whole, and while a group of ants will gladly live out there lives together, what keeps the colony interesting is the addition of a Queen. A queen or multiple queens with certain species is the engine behind and entire colony and can continue creating new workers for years and even decades. Fortunately, all temperate climates, include your backyard in Ohio are like to contain ants, and you have an opportunity every year to collect new queens before the disappear into the nest. On very predictable schedules usually during a short 2-3 weeks, ant colonies will participate in a flight know as “Nuptial Flights”. This annual or semi-annual flight consists of both male alates and female (future queens) leaving the nest and taking flight. During this flight, the males will mate with the females while in the air. Once the females have mated the return to the earth and seek out shelter and start a nest. It’s during this period that it is the easiest to collect a newly fertilized queen before her colony is established. Experienced collectors can easily identify queens by how they look and how they act. Once you have collected your queen the ant-keeping begins. Almost all ants have very similar requirements; humidity, protein, and sugar. In nature, ants control humidity and temperature within their nests by the size and depth of the chambers and tunnels within their nest. Since most artificial nests prevent ants from doing this on their own, is the ant keepers responsibility to ensure the nest provides the proper humidity and temperature. Sugars are what give the ant energy. Sugars come in many forms, including honey, fruits, and other specially prepared liquids design for use in formicaria. Proteins provided normally by insects are what give the ant the needed nutrition for growing their colonies. Mealworms, wax worms, crickets, cockroaches and chicken, ham or turkey are all common sources of protein for your ants.